At OutplacementPro, we are reinventing outplacement by using the latest technology and sophisticated algorithms to match the talents and personalities of our certified career specialists with the background and experience of your employees. This tailored approach and personalized attention provides the highest quality transition experience in the industry. What’s more, our methodology provides maximum individual attention coupled with the latest social media tools. Your candidates receive the best experience and most effective results, all at a significantly lower investment than the competition. 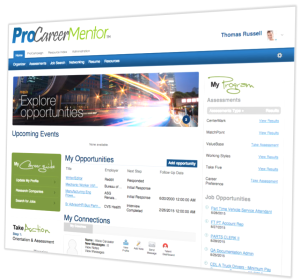 ProCareerMentor combines advanced solutions that include mobile, cloud-based systems, social networking technology, job search engines that update daily, automated resume creation and submission tools, and cutting edge resources along with a powerful career contact management system. The ProCareerMentor interface is intuitive and wizard driven, making the system easy to use. No training is required. Your transitioning candidates can receive and apply for jobs from over 1 million postings per month in over 50 different countries, and research up-to-date data and contact information for hiring managers from over 85 million organizations worldwide with access to 100 million contacts…all delivered automatically with daily updates. We also offer a comprehensive knowledge center of online resources, podcasts, videos, and tutorials in the latest career transition areas including job search, networking, social media, interviewing, and negotiation skills. These features work in harmony with our proprietary methodology to offer a highly effective and efficient solution for organizations and transitioning employees. We have developed a step-by-step proprietary methodology that is proven to get rapid results for your transitioning workforce. We surround candidates with a team of experts including resume writers, career strategists, and some of the industry’s most seasoned career coaches. At every critical step, your transitioning candidates receive personal help from the most experienced career strategists and coaches. Unlike many of our competitors, this individualized approach is tailored to the needs of each person. This means faster and better results with less stress and pain for the transitioning employee. Sixty days after the reorganization, I am now employed full-time in a job I love. Professional coaching, constructive feedback, the ability to keep structure and direction in my life are just a few of the professional services OutplacementPro provided to me. They have a unique team and provide truly valuable and useful services – not to be missed in today’s job market. I could not give them a higher recommendation! I was laid off after a company acquisition and was not sure where to begin. OutplacementPro was there to help me start the process. They had everything covered! They helped me with my resume, told me where to file for unemployment, and talked with me about my insurance options to see if COBRA was the best choice. Most importantly, they were there for me and understood what I was going through. They helped with my job search, prepped me for interviews, taught me new ways to search for job opportunities, and how to get in the door of companies and get noticed. The staff at OutplacementPro is awesome! Their first priority is ensuring that clients secure employment and present themselves as the strongest possible candidate. For me, OutplacementPro was an invaluable resource for resume writing and critique, interviewing workshops, and general job seeker motivation and peer support. I believe I was able to quickly secure interviews and in turn, employment, as a direct result of Prositions and the services they offered. 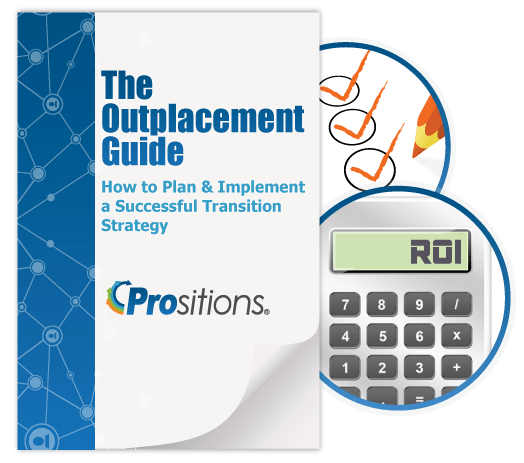 Get your Free, Interactive Outplacement Guide!